Texas Waste Co., is a local provider of the cleanest porta potty, hand wash station and restroom trailer rentals available. Since 1999, we’ve catered to the sanitary requirements of League City businesses, construction sites and special event venues and proudly boast a positive reputation within the communities that we live and serve. Our goal isn’t just to provide a positive experience for residents and businesses, but to build a positive relationship that can be depended upon, time and again when party rentals such as porta potties and hand wash stations are needed. Our commitment to quality, clean delivery makes Texas Waste Co. a sought after provider for porta potty brokers with needs near League City, too. They know that we’ll treat their customers like our own and that’s why they call on us as their supplier. Texas Waste, Co., offers simple pricing with no add-on or hidden fees. We believe in honest, clean business practices. As a local supplier of top-quality porta potties and hand wash stations, we can arrange for the same day delivery of party rentals or you can book with us in advance. The next time you need a portable toilet rental, know that you can depend on Texas Waste Co. to deliver on the kind of cleanliness that keeps your name and ours respected within the community. League City’s lineage dates back to 1973 and the settlement of three families: the Butlers, Cowarts and Perkins. The Cowart family settled on a creek now known as “Coward’s Creek,” the Butlers rooted inland on “Clear Creek,” and the Perkins hung their shingles near Bayou, which they named Magnolia after lining the banks with Magnolia trees. The area was originally known as Clear Creek until J.C. League purchased the land and renamed it. Though Butler was the postmaster and disputed the name, League City stuck. If your looking for the best service and price for porta pots in League City, TX we have them. 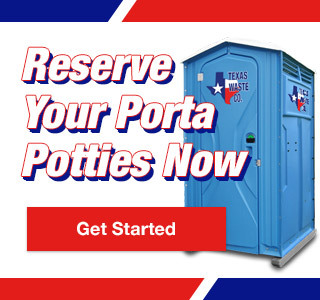 League City – Porta Potty Rentals Available Now!